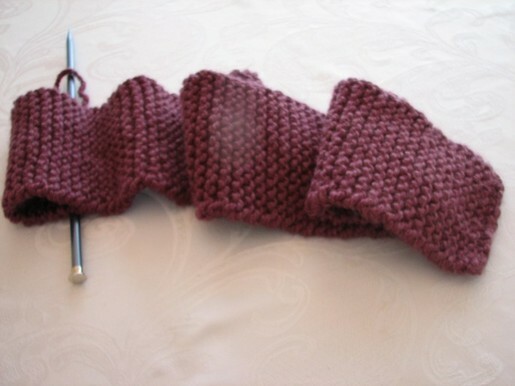 Last Sunday evening I decided that was going to be the day to embark on a new hobby -- knitting. I did some research online and then headed out to Michael's arts and crafts store. I was hoping to find a good book to use as a guide and reference but didn't find anything I liked. I picked up 2 "things" of thick yarn (I later learned they are called skeins) and a pair of needles that matched the size recommended on the skein of yarn. I decided I wanted to start with a scarf so I went searching for tips and patterns. 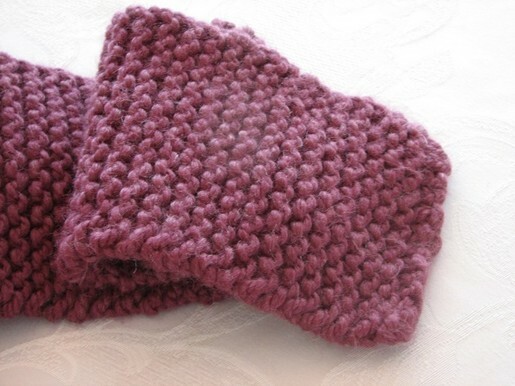 I found a couple of tutorials about how to get started and the basic knitting stitch. By bed-time Sunday night I had done a dozen or so rows. Then by Tuesday night I ran out of the first skein and needed to learn how to add another one to continue on. Even though this is actually quite simple (simpler than learning the casting and knitting stitch) I spent about 40 minutes Wednesday night trying to learn how to added the second ball of yarn and never got it right. I was a little overtired and got really frustrated. Then late Saturday afternoon I decided to try again. This time with a little help from my boyfriend (ha). We found another tutorial for adding a new ball of yarn using the knit-in join method and within 10 or so minutes I was back in business knitting away again. Now, one week later, my first scarf is almost complete. 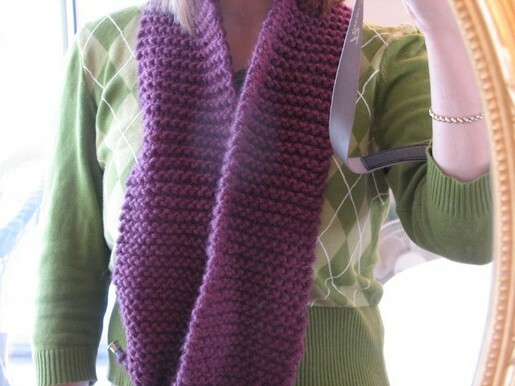 I had wanted to learn how to knit for quite a while, but was always a little bit intimidated by it. I am so glad I finally decided to go ahead and do it. It's actually quite easy. I am pretty happy that I now have a new hobby, I can now make some nice things by hand, and that I learned pretty much all on my own. I also think it will be a really great, somewhat mindless, activity to do before before. Should be a nice cure for those nights I have trouble falling asleep. If you've ever thought about learning how to knit but haven't done it yet, I highly recommend it. Wow! That was your first project ever? It looks great! It will become addicting. I'm so impressed! I love the color you chose for your scarf. My coworker is a knitter and she's always trying to encourage me to start, but I don't think I have it in me. I tried crocheting once and that was disastrous! You did a great job. Wear your scarf proudly! Debbie, thanks!! Yes, my first every try at knitting. It has already become addicting! Kathy, thank you! 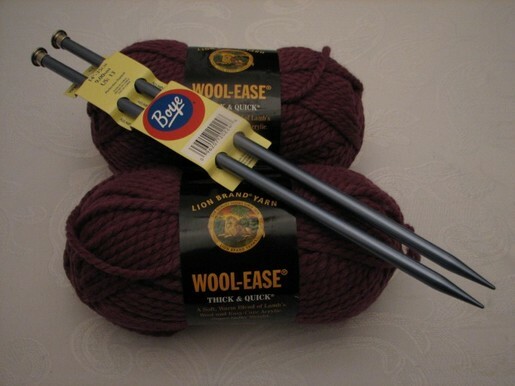 My eye was immediately drawn to the purple color as soon as I got into the knitting section. I am pleased with choice. It seems knitting is something you love, or try once and hate. I am completely jealous! I keep saying that I am going to learn and then never come around to it. I love the color that you picked out and it came out amazing!! This page contains a single entry by Erin published on February 7, 2010 7:47 PM. Paranormal Activity was the previous entry in this blog. For My Valentine is the next entry in this blog.